"We have raised our first round through BVC Ventures and will be starting discussions for the next round later this year." Bhavik Chinai, Founder & CEO, Vamaship pursued education in Indian School of Business, Hyderabad. 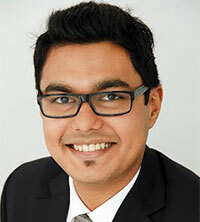 Bhavik worked with several companies and projects in supply chain management, venture capital and event management before joining BVC Ventures in 2013 as a Director. ​Bhavik has a keen interest in automobile, fashion, gadgets and mobile technology. He also enjoys playing soccer, reading and driving in his spare time. ​​Bhavik’s narrative of innovative endeavors and entrepreneurial success isn’t new. He has won multiple business plan competitions in college and has been acknowledged as the ET Young Supply Chain Professional of the Year 2015. Vamaship is a revolution in logistics, connecting shippers with industry's best logistics companies. Vamaship facilitates shipping at the cheapest cost through air, ocean and surface and also helps to automate shipping processes. ​Vamaship as a market place facilitates shipments to over 19,500 pin codes in India and 200 countries internationally. With a nationwide network of partners, Vamaship brings the best of technology and logistics to create a seamless shipping experience. ​Vamaship is focused on the vision & mission to become the world's shipping partner and to set global benchmarks in service quality, growth rate and stakeholder satisfaction, respectively. Replying to Yash Ved of IIFL, Bhavik Chinai says, "We have raised our first round through BVC Ventures and will be starting discussions for the next round later this year." Brief us about your business model? Logistics and shipping is vastly unorganised and currently has a major information gap among stakeholders due to lack of adoption of tech. Yet, the global logistics industry is worth over $1 Trillion dollars and has immense opportunities for startups. Vamaship is the world’s first integrated logistics platform which facilit​​ates shipping via air, ocean and surface for e-commerce companies, SMEs and individual shippers. As a managed marketplace, Vamaship fulfils shipments through its partners which are freight forwarders, transporters and courier companies. The Vamaship shipping platform algorithm chooses the best partner to optimise through for each shipment based on several parameters, while giving the shipper a seamless shipping experience and cheapest price. Vamaship’s revenue is the shipping price which we charge customers and earn margins on the difference between the buy and sell price. We have offices in Mumbai, Bangalore and Delhi and will be having offices in 25 cities by June. We’re currently servicing 19,500 pin codes in India and facilitate shipping to and from 200 countries. Our expansion is primarily focused on customer acquisition and revenue where we aim to increase our monthly revenue by 400% by November. Vamaship primarily deals with small and medium enterprises and growing e-commerce companies and the current customer base is across sectors. The range of customers is across one of world’s largest mining company to India’s largest online jewellery store. Which are your target cities? As a network for delivering goods, we have covered the world with over 200 countries and over 19,500 pin codes in India. For sales, we’re primarily targeting customers in Mumbai, Bangalore, Delhi, Hyderabad and Ludhiana. What will be your focus area going forward? Our focus is on growing the number of customers in ocean and e-commerce and develop better technology. Our shipping platform is helping logistics teams of customers save almost 40% of their time and saving immense costs, and with further automation, we aim to reduce the time and cost of shipping.